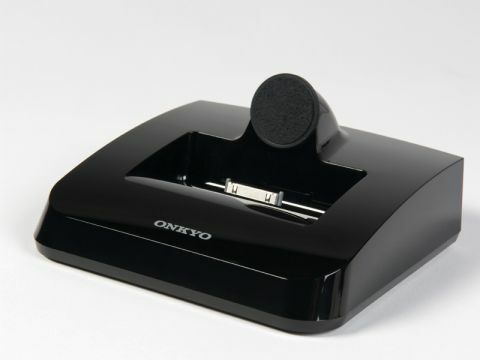 Onkyo has just announced the first affordable digital iPod dock, the Onkyo DS-A3. so are analogue docks now redundant? Not according to Onkyo's representative, to whom we put that exact question. He pointed out, reasonably enough, that not everyone will have a digital input available, nor will they want to buy a separate DAC just for an iPod. Accordingly, this dock is optimised for extracting the most from an iPod's analogue output. It has much the same connections as most, though the provision of a component video output is not so common. You can use an external TV or the iPod's own display as monitor while operating with the iPod's own buttons or the supplied remote. Using the iPod's buttons is easier than on many docks, as this one has some weight to it and decent non-slip feet, so it doesn't slide away! The adjustable backrest for the iPod is a neat idea too. Output level is very low at 0.7 volts. We felt that the sound of this dock didn't quite match up to that of the Cambridge, but it's quite a close thing. There's plenty of detail to the sound and some impressive extension at both frequency extremes, but it doesn't quite hang together with the same convincing realism, and as a result one is just that little bit less involved. All the same, there's a lively character in evidence, which makes the most of energetic rock, for instance, and for foot-tapping inspiration this is a hard act to beat. It's also quite dynamic, making the most of well recorded classical tracks with their large changes in level.